The price of £304 includes a bed base. 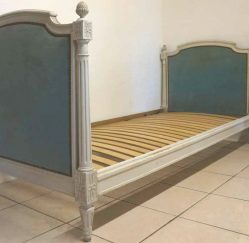 For details of this bed excluding a bed base and to see more photos click here. An elegant Louis XVI style small single bed. Circa 1930s. Measuring 2 ft 8 ” wide, this is an odd sized single, slightly smaller than a standard UK single which is 3ft wide. Typical French châteaux, authentic shabby chic style. Lovely carved bed posts, with acorn finials. The wooden frame is painted in white, over a grey primer and shabby / marked / chipped etc – we have given the bed a light clean, and the paintwork could be cleaned further to take it back whiter. Upholstered in its original light blue velvet fabric. The fabric is in reasonable condition on all but one of the sides. Back of the headboard – Excellent. Front of the headboard – Some marks as shown below. Inside of the footboard – Large mark as shown below. There is no woodworm to note. The bed fits together well and tightly. Included is a slatted bed base to fit. 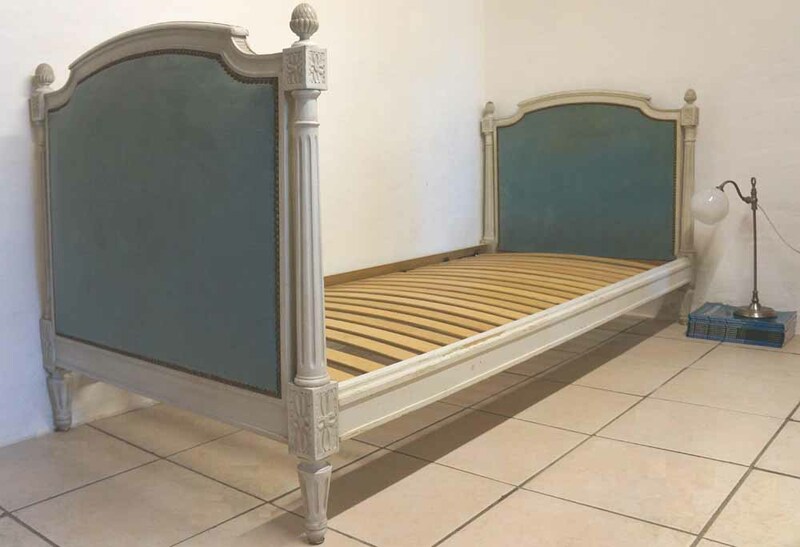 This is a used bed base but in excellent condition. The bed is 81 cm wide (2 ft 8″) with a standard length of 6 ft 3″ long. A mattress can be sourced from most local retailers. Purchased in South West France. Headboard – marks to the top and bottom, but much lighter than on the footboard.